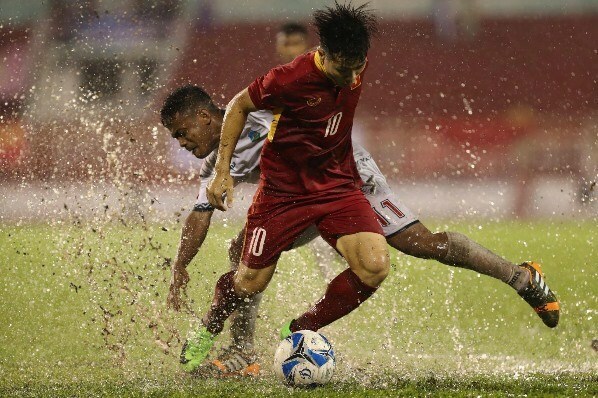 Hanoi (VNS/VNA) - Vietnamese striker Nguyen Cong Phuong has been selected as one of five best potential J.League strikers in Southeast Asia by the prestigious website foxsportsasia.com. Phuong performed well in the recent 2018 AFC U-23 Championship qualification and in the friendly match between Vietnam’s national U22 squad and the Republic of Korea’s K.League All Star team. “He was the standout player at the recent AFC U23 qualifiers, where he dazzled with his exceptional poise and control on the ball. His driving runs and finely tuned and accurate range of passing were outshined only by his ability to grab one of the goals of the tournament in a narrow loss to powerhouse the Republic of Korea,” said the website. “A graduate of the famed Hoang Anh Gia Lai academy in the south of Vietnam, the 22-year-old has already spent a brief stint in Japanese football when he was on loan last year at J2 Mito but after being scarcely used then he returned to his homeland where he’s been an ever-present for club and country. “One of the finest midfield technicians anywhere in Southeast Asia, if Phuong isn’t disheartened by his earlier spell and returns with the right attitude he is more than capable of playing at the top flight,” the website added.